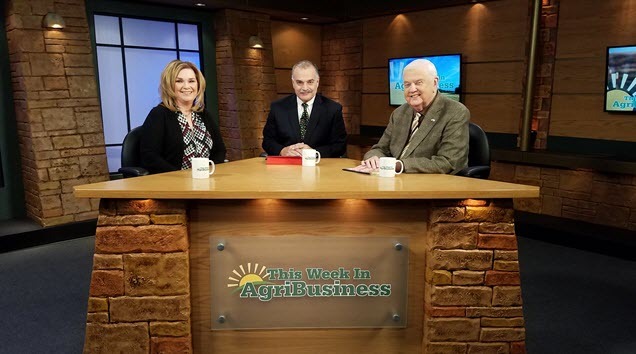 Before we get started, publishers of the Swine Times were on the weekend “talking head” shows This Week in Agribusiness and US Farm Report. Check out Donna and John below by clicking on the images. They will take you to the videos. Thank you to both programs for having us on, we are so excited our first year in publication has gone the way it has. We will do everything we can to keep things going in 2018. The product market did top out this week and will continue to struggle for the next couple of weeks. Swine Times stated last week that the ham ands bellies would lose the most on the carcass cutout. That has proven to be the case this week. Here is the breakdown. Bellies were the biggest loser for the week, starting out on Monday’s close at $135.04 and finishing the week Friday at$109.37, for a loss of $25.67. At these lower levels, hams and bellies will find buyer interest from both the processors and the export markets. Taking the prices lower now, in our opinion, could prove to be very constructive as we go into the newyear. Loins and butts have already given up about as much value as they are going to for the time being. They have even started to move higher. The retail chains may choose to run ads for these, given the bargain prices at which both of these retail cuts are currently selling. Watch your newspapers’ grocery ads for confirmation of this. We mentioned in last week’s newsletter that we were concerned with the Interior Iowa Weights having a possible back up of the market ready hogs. After looking at the Interior Iowa Southern Minnesota weights that came out Wednesday 12/13, we are pleased to say that as of this writing, this scenario doesn’t appear to be the case. The weights came in this week at 286.1 versus 286.9 last week and 280.7 last year. While they are still over 5 pounds heavier than last year, the positive take away from this is that the weights came down .8 of a pound compared to the week prior. Next week, there is a USDA cold storage report. Be sure and compare how many bellies went into or came out of cold storage this past month. Then compare that to the previous month and the previous year. This could be key to what hogs do the first six months of this next year. 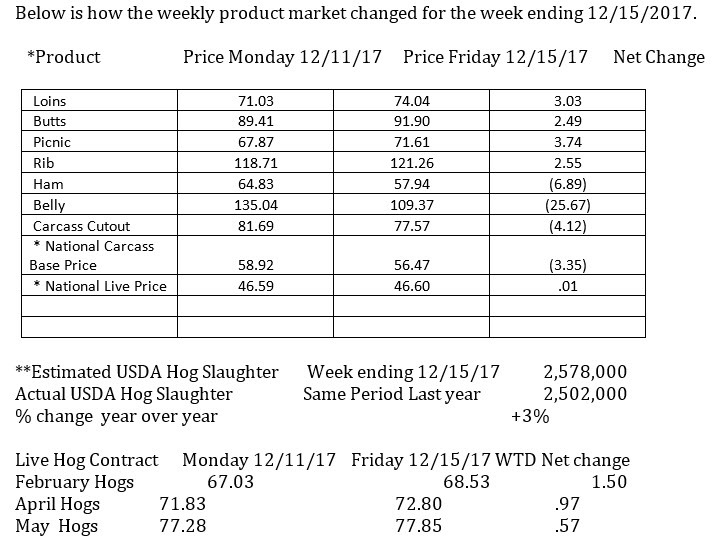 Next Friday 12/22, we will have the USDA December Hog and Pig Report. Below is the breakdown of the estimates we have gathered to date. 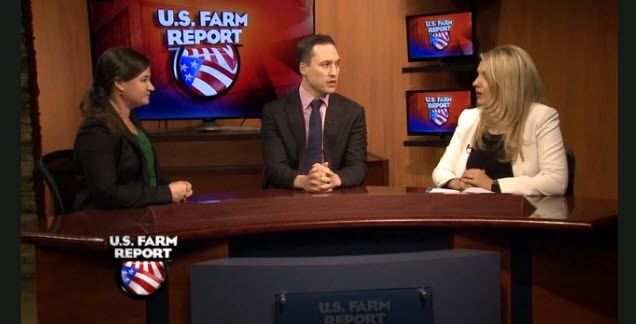 Our recommendation is to trade lightly in consideration of the upcoming holidays, the December Hog & Pig Crop, and the USDA monthly cold storage reports. We still recommend buying February hogs under $67 or $66 if they get that low. Watch for the opportunity to buy April hogs under $70. Pay attention to news of sales out front to China and Southeast Asia, as well as other export news. With pork priced this low they are a value to the overseas markets, so we look for export sales to pick up in the first quarter of 2018. Continue to watch the weather and adjust your positions accordingly.